4.88" x 2.48" x 2.48"
The new Kill A Watt Edge makes it easier than ever gain insight on your consumption with new features, for everyone from the average consumer to the most tech savvy! 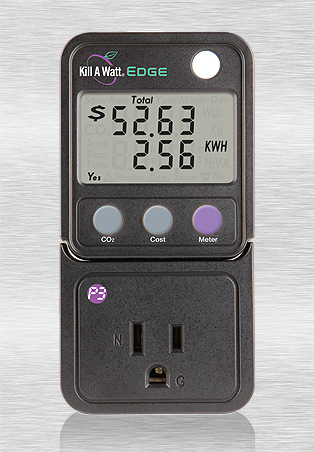 The Kill A Watt Edge has all the measuring capabilities of its predecessors, plus a CO2 function so that you can calculate your carbon footprint and a dual display that shows multiple types of information at once. It even calculates the consumption and cost of your devices when left in standby mode! Once you know how much each device uses, the easy to use the programmable motion sensor will turn them off when not in use. After time, the Edge will learn your behaviors and tell you how much you have saved when your devices are really off. Features a tether that allows you to place your meter near the item you are measuring without having to bend over or unplug the device to view data, a built-in motion sensor and an over current protector. Get an Edge on your utility bill. Save power, time and money with the Kill A Watt Edge! 15 Amps, 1980 Watts, Resistive and Inductive 600 Watts Tungsten 1/3 H.P. 120 V.A.C.